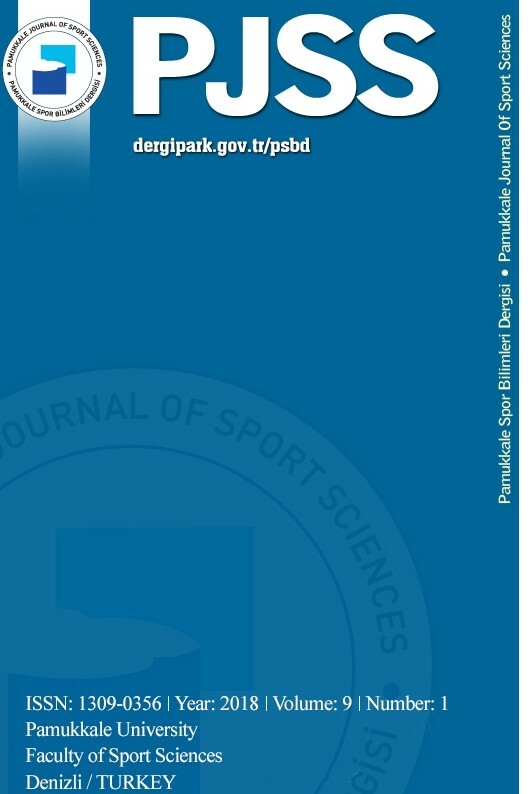 Essays in English are published in Pamukkale Journal of Sport Sciences. Writer/s accept that the essay is original, it was not sent to another journal to be published, it was not published before, it is obeyed the principles for human and animal research recommended in the Helsinki Declaration, they took all responsibility to get permission for using the scale, survey, inventory, test etc., they took all responsibility for opinions expressed in the essay and give copyright to Pamukkale Journal of Sport Sciences. No fee is paid for issued essays in Pamukkale Journal of Sport Sciences. Acceptation or rejection response of the essays can change according to the duration of scientific advisory board’s examination. It is required to keep all data of issued essays for 5 years by the writer/s. Essays sent to the journal should be typed with Microsoft Word, one and half (1,5) spaced with 2.5 cm. margins on all sides and 1.5 cmparagraph margins. You should use 12 pt. Times New Roman font, page numbers should be bottom and right corner of the pages and page formation should be in justify format. Head line should consist of maximum 14 words. There should be names, surnames and institutions they work for under the heading in accordance with the author order. Address, phone number and e-mail address of one of the author should be given. If essay is a summary of thesis or there are supporting institutions or if there are people that writer wants to thank it should be stated as authors’ note after the references list. Abstract should be in English with the titles 'Abstract', one paragraph that contains less than 350 words. Key words (4 to 10 words) should be presented under abstract with the name of 'Key Words'. Aim, subjects, data collection instruments, method, data analysis, shortly results and short conclusion should be presented in abstract. Text should contain introduction, method, results, and discussion respectively. Method part should contain four titles which are; subjects, research group or sample, data collection instruments, method or data collection and data analysis. Tables and figures should be in their own places in the main body. Table numbers and titles should be above the tables. In the table titles initial letter of only first word should be capitalized, other words should be all small letters. While using abbreviations, its meaning should be written in parenthesis in the first place it comes up. · The author's last name and the year of publication for the source should appear in the text (Jones, 2011) and a complete reference should appear in the reference list at the end of the paper. · If more than one study is cited, references should be written in alphabetic order (Archer, 1993; Treasure and Roberts, 1995; Witkin et al., 1977). If there are more than two writers only first writer’s last name should be given (Stelzer et al., 2004). Reference list entries should be alphabetized by the last name of the first author of each work and all lines after the first line of each entry in your reference list should be indented one-half inch from the left margin in references part. Demirhan, G., Altay, F. (2001). Lise birinci sınıf öğrencilerinin beden eğitimi ve spor dersine ilişkin tutumları ölçeği II. Spor Bilimleri Dergisi, 12(2), 9-20. Tezbaşaran, A.A. (1996). Likert tipi ölçek geliştirme kılavuzu. Ankara: Türk Psikologlar Derneği Yayınları. Milli Eğitim Bakanlığı İlköğretim Genel Müdürlüğü (2007). İlköğretim Beden Eğitimi Dersi (1 - 8. Sınıf) Öğretim Programı ve Kılavuzu. Ankara: Devlet Kitapları Müdürlüğü. Biddle, S.J.H., Chatzisarantis, N. (1999). Motivation for a physically active lifestyle through physical education. (Y. Vanden Auweele, F. Bakker, S. Biddle, M. Durand, R. Seiler, Ed. ), Psychology for Physical Educators, pp. 5-26. Champaign, IL: Human Kinetics. Mosston, M., Ashworth, S. (2000). Çev: Eda Tüzemen. Editor: Gıyasettin Demirhan, Beden Eğitimi Öğretimi. Ankara: Bağırgan Yayınevi. Hünük, D. (2006). Ankara İli Merkez İlçelerindeki İlköğretim İkinci Kademe Öğrencilerinin Beden Eğitimi Dersine İlişkin Tutumlarının Sınıf Düzeyi, Öğrenci Cinsiyeti, Öğretmen Cinsiyeti ve Spora Aktif Katılımları Açısından Karşılaştırılması. Unpublished Master Thesis. Hacettepe University, Institution of Health Sciences. Ames, C. (1990). The relationship of achievement goals to student motivation in classroom settings. Annual Meeting of the American Educational Research Association, April, Boston.